I was born in Pittsburgh, PA in 1974, lived in Taiwan for 2 years. After undergrad in Philadelphia, I moved to live on a 30’ sailboat in Miami, then an RV in Vermont on a goat farm, then back to Florida only the St. Petersburg area, then to Brooklyn, gave birth to Chloé in Kentucky and stayed there for about 4 yrs before coming to Athens for grad school. I started the MFA program as a 35 year old, single mother of a 4 year old, going through a divorce. It was in grad school when I started working with ideas of objectivity and subjectivity studying many French feminist theorists. From there I began the research into maternal subjectivity (or the lack thereof) specifically in the gallery. This is the foundation for the work and continued research that I do now. After grad school, I was a full-time adjunct at Ohio University, then took a job as the gallery director at a local non-profit art center before moving into my current position as the Gallery coordinator for the Ohio University Art Galleries. This is a part-time position, 10-month contract in which I teach only one semester leaving the remaining time for me to return to a studio practice. After 2.5 yrs at the non-profit, working pretty much 9-5pm M-F, I lost a lot of what I gained from grad school in terms of a studio practice. While I had continued to be asked to participate in exhibitions and artist visits and lectures, I knew that if I didn’t get back to making that eventually those opportunities would dry up. There really wasn’t anything from my ‘formal’ training. None of my undergrad professors had children running around and I definitely do not recall if they even had any because they didn’t talk about them. My mom was creative at home and worked for J.C Penney organizing fashion shows for eight years. During this time, she would bring us to work with her often. We even helped putting names on bagged jewelry, etc. It was that example of non-separation from home and work that I guess wore off on me and gave me what I thought as the normal way of working. Though I did not do the same thing with my dad, I still thought of it as normal. First, my own mother is an inspiration and constant person of support and belief. At the time when I first started making work about subjective maternity, around 2009, there wasn’t that much theoretical literature out there about it and very little actual artwork about it. Now, that has changed completely! In just a matter of 7 years, the growth and expansion of critical and psychoanalytical theory and artists working in themes of the maternal has changed the field. Beyond Mary Kelly and Mierle Laderman Ukeles, these are some amazing theorists, art historians, artists and friends working in themes of the maternal are Jennie Klein, Andrea Liss, Myrel Chernick, Lise Haller Baggesen, Natalie Loveless, Jill Miller, Lenka Clayton, Alejandra Herrera Silva, Lisa Baraitser, Irene Pérez Gil, Deirdre Donoghue, Griselda Pollock and so many many more. Can you talk about how you balance your role of artist; and the role of mother? Did you take time off after the birth of your daughter? How did that work? What about childcare? Studio Time? I had moved from Brooklyn, New York to Morehead, KY to live with Chloé’s father when I was 6mos pregnant. I guess in one sense, I took time off because I wasn’t riding my bicycle all over New York City painting murals and doing faux finishes anymore. I didn’t have a huge studio practice while living in the city because I was trying to make ends meet all the time. Once I moved to KY, the overhead was less and I had a partner to help with costs. I also had community of artists who were faculty there and use of those facilities, a luxury that is very difficult to find in NYC. I started making more using the back room of our house as a studio. After I gave birth, I would make while she napped or whenever I could. I did some more ‘women’s work’ type of artwork like sewing the words ‘blood, piss, and tears’ into raw canvas with metallic glass seed beads. I played around using breast milk as a mixing medium in watercolors and making milk drawings on black paper… I guess I have had my daughter in the studio for quite awhile. While I understand that not all mother/artists make work ABOUT being a mother, that was my way of balancing it. I wanted to “Perform the Visibility” of maternity. By including my daughter in my work and my studio, I was able to care for her while attempting to make work. Eventually, the “studio practice” shifted from a grad school studio to my home and the work became more and more sourced from the home. I began recording sounds from home laying down the tracks one on top of the other without editing. This was the beginning of me using the cacaphonic atmosphere that life with child is. One time during that period of recording, Chloé was getting ready for school (I think it was kindergarten) and had a tantrum. I just pressed record and continued getting breakfasts and lunches ready knowing that is would pass, eventually. We were both late for class that morning. When I arrived, I explained to my students what had happened and that I had the proof if they wanted to hear. To my surprise, they did and it was at that moment in the classroom, listening to the tantrum that had just happened moments ago- at home- , that i realized the shift from private (domestic) to public (gallery). Your work blurs many boundaries; home versus private and domestic versus studio. In your piece In Balance With you and your daughter create the performance together. Does the finished work reflect the process of conception, fabrication and practice? Does the blurring occur in reverse and is your daughter present in the studio as well? 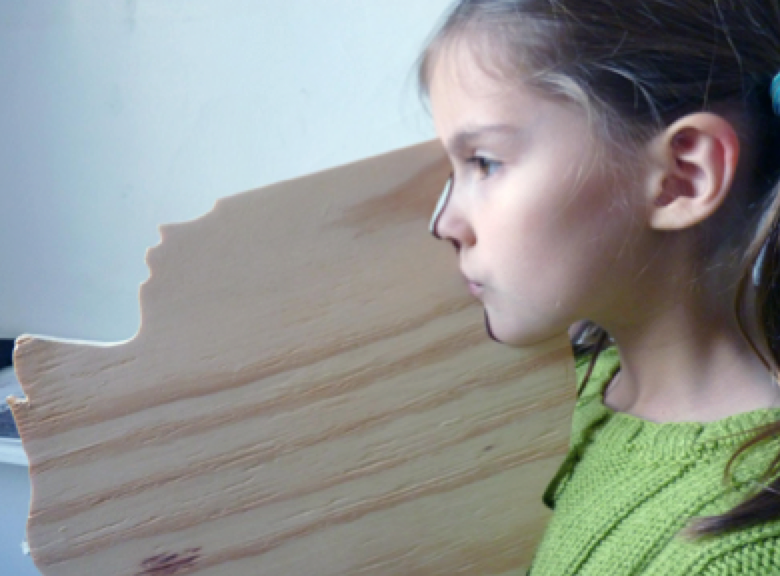 This is in the studio with Chloé putting her face in the sculpture cut out Spaces in Between. The ‘studio’ is a small spare bedroom in our house. It’s funny. I’ve made such a practice of blurring those boundaries that when applying for residencies this winter, I had a really difficult time coming up with what projects I would propose to do away from home…! 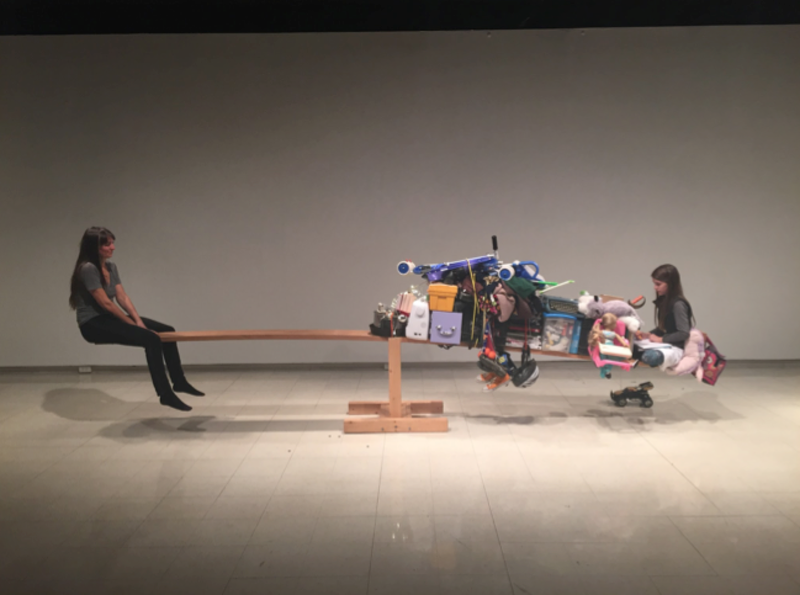 The performance and subsequent sculpture In Balance With is a very good example of those boundaries merging and blending together. Initially, when I first had the idea and invited a few people to view it, I didn’t know how it was going to end. During the performance, I would talk quietly to Chloé checking in with her and making sure she was ok and still wanting to be performing. It wasn’t until I reached the balance that I asked her if she wanted to come down. When she said, “no”, I realized that the performance would be over when she says. It is when (really and truly) she is no longer content and occupied and ready or needing something different. It became and still is a metaphor for our lives together. If I’m reading in bed and she needs me to make something to eat, I have to stop and go take care of her and then I return to what I was doing. 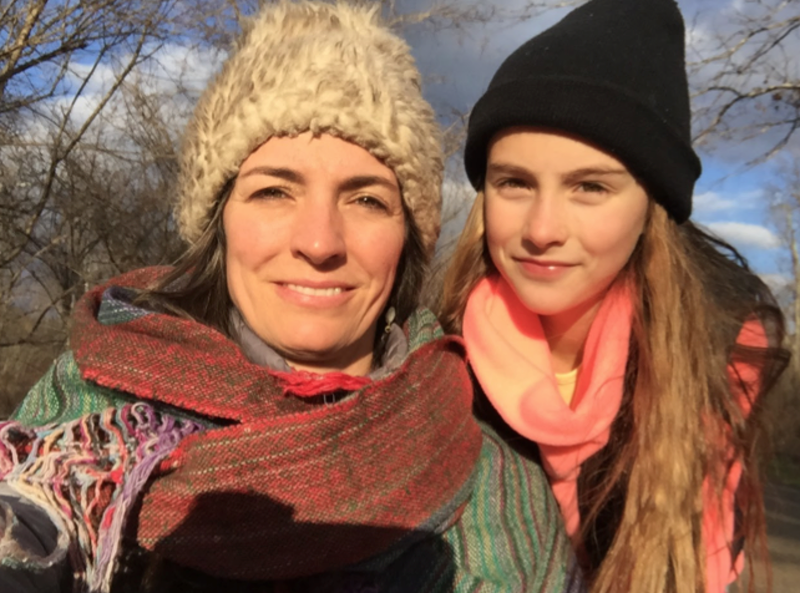 How does making work with your daughter work? Is it a collaborative process? Do you find yourself more in the role of director? How has this informed your relationship with one another? Collaboration is a difficult term to use in this way. As a mother, I am already the one who directs and instructs. As an artist with an education and research based in critical and contemporary theory, I have certain criteria that need to be met (in my own mind) to produce a work of art. I think the ideal situation for “pure” collaboration would be to come up with a completely collaborative project together from start to finish. As it stands, she is a willing and capably co-creator. I kind of set up the system and she produces within that system. 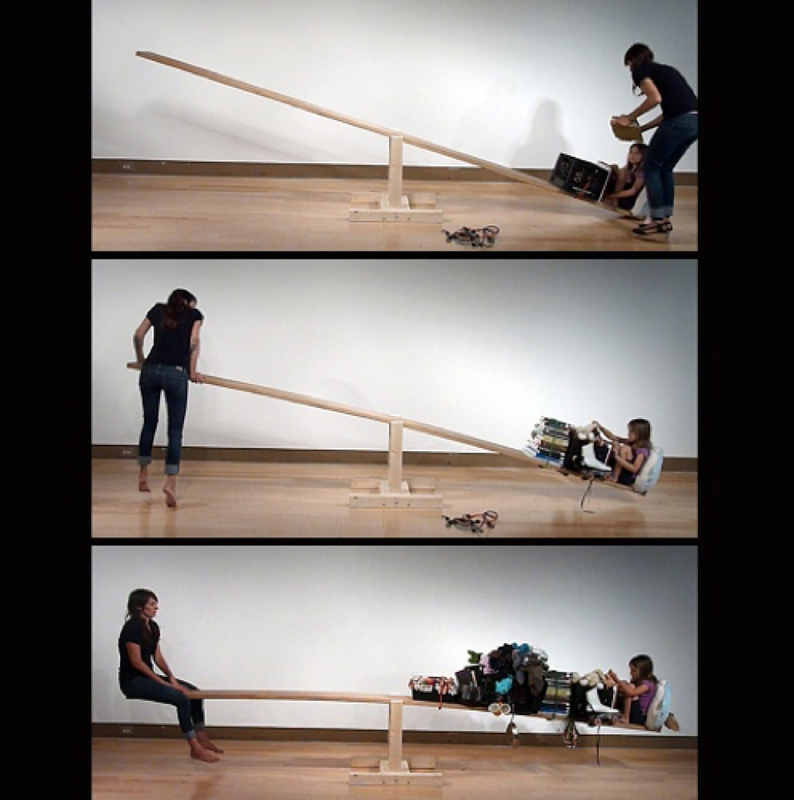 The above image is from a two-person exhibition at ROYGBIV in Columbus, Ohio. Two pieces in that show were fairly collaborative. One is the video Sharing Space in which Chloé tries to put on or wear clothes that I am already wearing. This piece came about as we were sitting in a chilly restaurant waiting for food to arrive. She got onto my lap and slid her arms into the cardigan that I was wearing. She was the one who said that this would be a good performance. From that suggestion, I set up a couple scenarios in the studio and recorded them. I then edited the video to what I thought were the key interactions that speak to both her idea and the overarching concept of maternity. The other collaborative piece is the collection of 36 6” x 6” canvases to the right in the above photo. This was conceived to be worked on only together at the same time and without edit. We could manipulate any of the canvases at any time, but only while we worked together. It was the system that I set up in order to both collaborate and spend time together. In my mind, it was a fairly even collaboration. Can you talk a bit about the quest to examine the seen and unseen sides of motherhood? 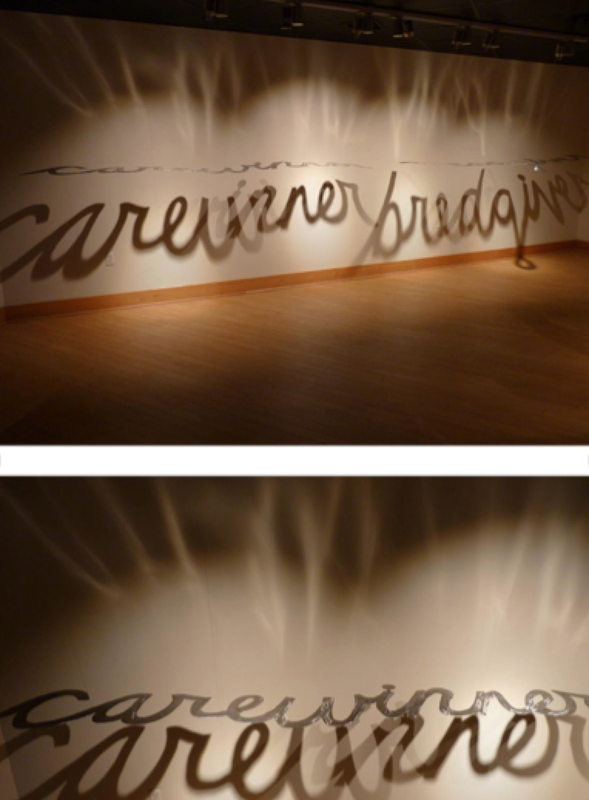 What do you hope the viewer will learn or take from interacting with your work? We are now in the third wave of feminism. Much work has been done by our predecessors to help get us where we are today. Feminist art take many forms. I am particularly interested in putting the subjective maternal in the gallery. Many feminist artists from the second wave found that they were beginning to have a voice in their experience of being female. Much of the artwork from that period revolved around the female body and the particulars of women’s experience. There wasn’t a lot of work about the specific experience of being a mother. Two key artists from the mid-70s, Mary Kelly and Mierle Laderman Ukeles, contributed some of the earliest works on the maternal. The work that I am doing is in hopes of opening up a conversation about the subjective experience of being a mother. When in comparison to not being a mother, it is a very different experience. The biggest and most obvious is that you are never not a mother after becoming one. You will always have an ‘other’ person out there in the world that you care about. I don’t want to people to think I am child centric or that my work is all about my child. It’s not. It’s about that subjectivity of my personal experience. This may resonate with others or it may not. What I hope for viewers to take away is just that it is a valid perspective from which to speak. I just finished a series of 18” x 24” printed photographs of different spaces around the house titled, Without Chloé. These are destined for an upcoming exhibition at the University of Alberta, Canada, curated by Natalie Loveless, called New Maternalisms: Redux. In these photos, I have literally cut out with an x-acto blade all things that are by Chloé, about Chloé, from Chloé, etc. It really illustrates just how much ‘stuff’ is about the child (ren). It also shows the lack present without that stuff. The photos are sandwiched between two clear pieces of plexi that allow for shadows of the cut outs to project onto the wall. They feel very sculptural to me. 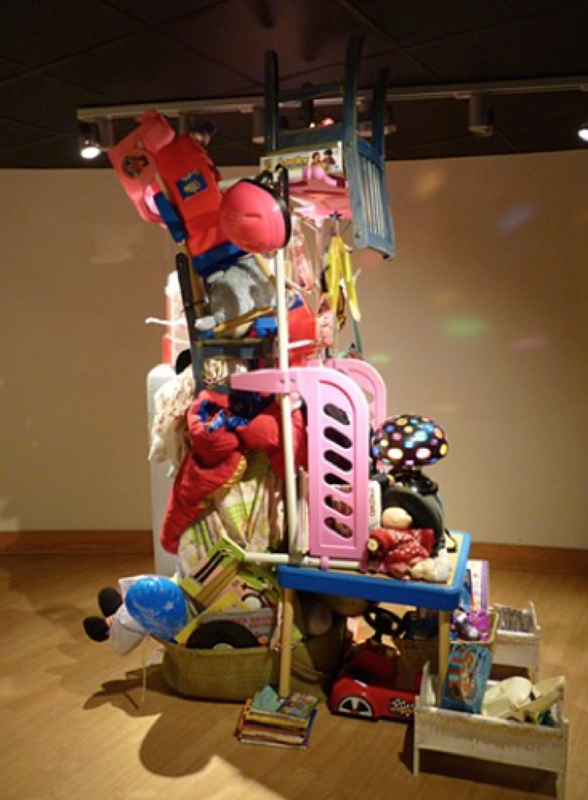 I have done floor to ceiling sculptures of ‘stuff’ from home (see below from the Mother Lode solo exhibition at Fairmont State University). These sculpture emphasize the presence of a child. None of these things would be in my life without Chloé. It’s kind of nice to be working in a studio on pieces that can be shipped. I feel like a lot of work is installation or performance based, thereby requiring my body to be there. Chloé and I will perform the annual In Balance With in Alberta and there will be two other additional pieces in that show. I have another audio piece that I am working on. I’m just looking forward to the semester ending and getting into the sculpture building to play around with cutting out some more words in steel. I have been running fairly regularly. I don’t run long or far, just 3 miles or so. Chloé is now old enough to keep up and even go faster in some instances! I’m devouring some new books, Maggie Nelson’s The Argonauts, Miranda July’s The First Bad Man, The Season of the Witch by Gail Griffin (not the TV series or movie) but a feminist take on growing up in the 60s and how women relate to one another and aging, Feminism, Psychoanalysis, and Maternal Subjectivity by Alison Stone, re-reading the ever inspiring Mothernism by Lise Haller Baggesen and Jennie Klein and Myrel Chernick’s The M-Word.